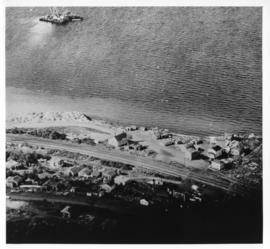 Item is an aerial photograph of Halifax's North End, including Africville. 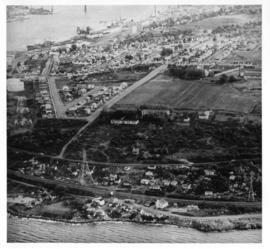 The photograph was used in Donald Clairmont's "Africville Relocation Report" ("'In' But Not 'Of' The City" pg. 3-20). 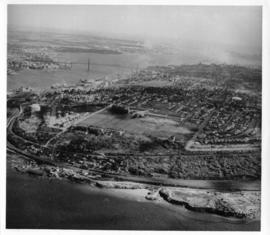 File contains aerial photographs of Halifax's North End, including Africville. 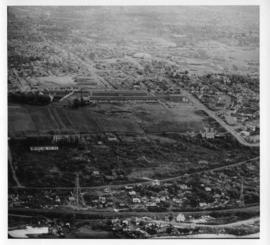 The photographs were used in Donald Clairmont's "Africville Relocation Report" ("'In' But Not 'Of' The City" pg. 3-20). File contains copies of six handwritten family trees of Africville families, prior to assigning pseudonyms. File also contains correspondence. File contains photocopies of handwritten notes for Brown family compiled from the 1851, 1861 and 1871 censuses. Copies of CBC radio program "Between Ourselves They Endured"
File contains two audio reels ( ¼ in. tape) containing recordings of "They Endured"
File contains 26 of the same genealogical chart, using code names of six major Africville families. File contains 36 copies of the same genealogical chart, using code names for the six major Africville families. File contains income and rental records compiled by the Halifax Housing Authority about a former resident of Africville. File contains Halifax Housing Authority records related to a former resident of Africville, including an application for accomodation. File contains income and rental records compiled by the Halifax Housing Authority on a former resident of Africville. File contains summaries of interviews undertaken by Henry Wells, with human subjects forcibly removed during the Africville Relocation. File contains information about conversations with interviewees #2, 5, 21, 88, 89, 117, and 118. File contains correspondence from the City Manager and the Housing Authority of Halifax regarding the purchase of properties during the Africville Relocation. File contains blank application for municipal social assistance, application for accommodations, and Halifax Housing Authority inspectors' report forms.